Revelers spend plenty of nights here partying on the rooftop lounge, tragically unaware of the culinary magic taking place beneath them -- specifically the Chipotle Mac & Cheese, a heaping portion of cheesy baked macaroni topped off with chipotle dressing, with the option to further fortify it with grilled or fried chicken. The chipotle puree will definitely light a fire in your mouth initially, but it also does a nice job cutting the flavor of rich, gooey cheese. Hillside Farmacy is popular for their oysters, reliance on local farmers, and wordplay -- and also their diet-destroying mac 'n cheese. 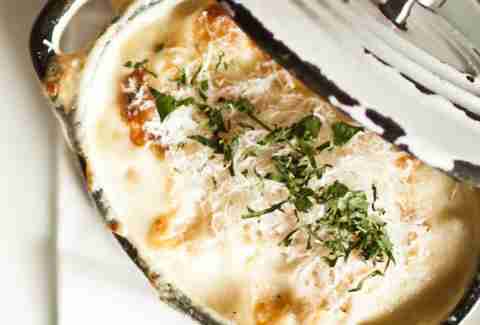 This version is coated in Mornay, which is a béchamel sauce that is thickened with cheeses, usually Parmesan and Gruyere. Toss in some herbs, top with breadcrumbs, and you have yourself a party. If you really wanna ride the lightning, spring for the additional poached egg and pancetta. 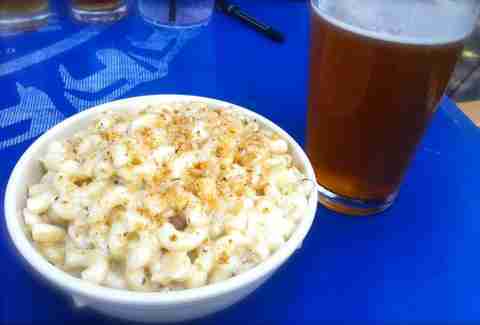 This popular "Sunday Funday" spot is worth hitting any time of the week for their dynamic duo of mac options. 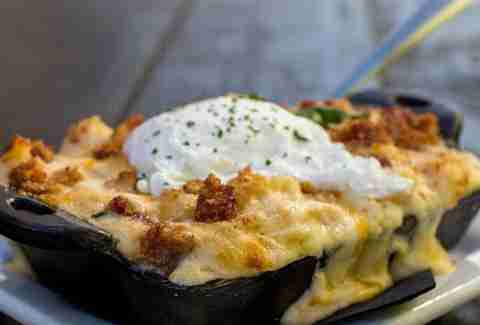 The baked mac with pimento cheese and bacon is a perfectly delicious side dish, but if you really want to get serious (which you DO! 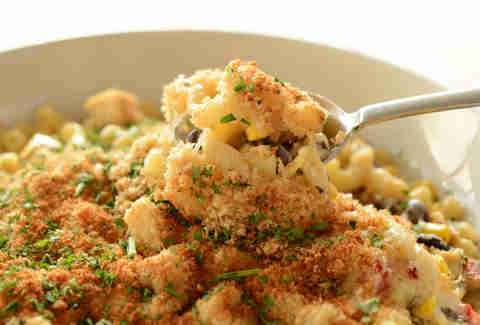 ), go for the Green Chili Macaroni packed with grilled chicken, corn relish, and (of course) a green chili cream sauce. It adds just the right dose of texture and Tex-Mex flavor to the action. Chef Shawn Cirkiel took a big risk opening an upscale gastropub between the shot bars and bad decisions of Sixth Street, but after running strong for more than five years, Parkside has maintained a touch of class in the area. The oysters and fresh fish might be a highlight as a starter, but once you're looking to complement your main course (pro tip: go with the pan-seared rabbit) do yourself a favor and get the Gruyere and cheddar baked macaroni. The creamy, savory, salty, mac is like heaven on the tongue, provided you let it cool, as it comes out of that crock seriously hot. The wings at Pluckers are rightfully outstanding (they're in the name! ), but if you’re looking for something to snack on before the wings fly to the table, the Holy Macaroni is definitely the way to go. Imagine fried cheese sticks but instead of some processed stick of string cheese, you bite into a golden fried creamy stick of macaroni. You might just find yourself turning this appetizer into a meal. On the plus side, you can always take your wings to-go. What could better than barbeque and beer? 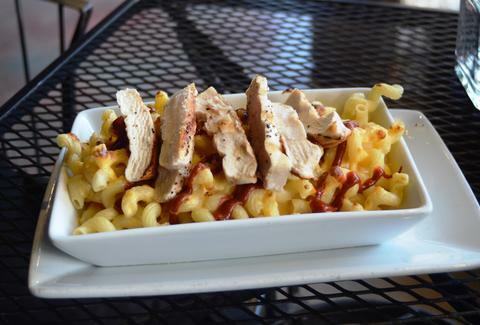 Not much, but barbeque, beer, and mac 'n cheese happens to be one option, and Uncle Billy's is the ideal complement to their excellent smoked meat and suds. 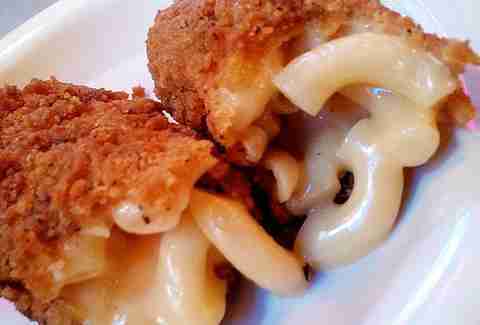 Imagine macaroni swimming in a queso-like sauce and topped with butter crumbs. Now, imagine you just dumped a heaping scoop of pulled pork into the mix, because you're smart. Now imagine you're chasing the whole thing with a Green Room IPA. Okay, enough imagining, go do it! You would think this would be a mecca for Packers fans, but the gourmet grilled cheeserie is actually a Denver native. They have an army of amazing sandos loaded with assorted toppings and Wisconsin cheeses. More importantly, they have two mac-based numbers: the Mac Attack and the Mac ’n Que. 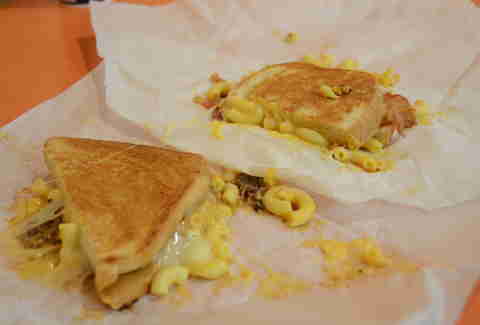 The Mac Attack is a gooey mess of macaroni, bacon, and mozzarella sandwiched between buttery slices of sourdough bread, while the Mac ’n Que appeals to Texans with grilled up macaroni, BBQ beef, and Havarti on Texas toast. Whichever your pick, napkins are advisable. 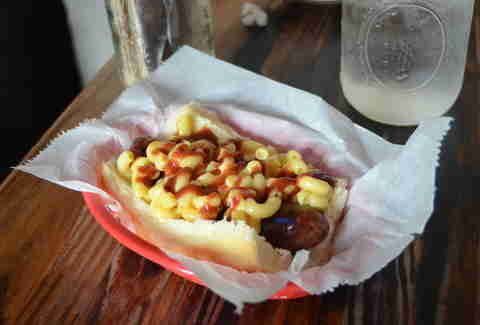 Who says you can't enjoy your mac 'n cheese via a delicious hot dog? Not Frank, whose Notorious P.I.G. takes a pork, bacon, jalapeño, and sage sausage, lays it on a toasted sweet kolache bun, and tops it with their cheesy baked macaroni and a drizzle of their Dr. Doppelganger BBQ sauce. It's creamy, smokey, spicy, and meaty all at the same time. It's not a bad idea to order two. 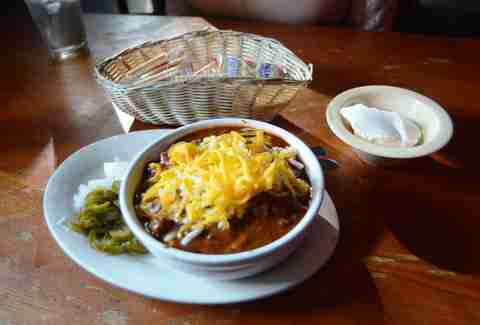 Texas Chili Parlor is an Austin original that has been cooking up chili for almost 40 years. What makes their tasty chili even tastier? Making it into chili mac ’n cheese, that's what. Get some sour cream, raw onions, and jalapeños into the mix for more flavor than you'll know what to do with. Unless you know that you should eat it, in which case we were wrong and you knew just what to do with it.